The villa is fully air-conditioned. The 30 ft. extended swimming pool is south facing and backs onto the golf course which has the added advantage of not being over-looked by another villa backing directly onto the property. Our villa is a large 4 bedroom family home, which can comfortably accommodate upto 8 people with a total living area in excess of 2,000 sq. Ft. There is also the added advantage of two reception rooms downstairs. The master bedroom features a queen-sized bed with cable T.V. flowing into the en-suite bathroom with both a large shower cubicle and bath along with double sinks housed in a large vanity unit. This leads into a large walk-in wardrobe/dressing room. There are 3 further guest bedrooms: a second double bedroom, furnished in an “all American theme”, a twin bedroom and the Pooh & Tigger's Den, an exciting room that will delight the children, or indeed the young at heart! 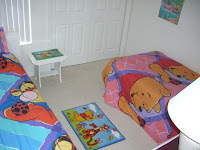 It is totally themed with Pooh and Tigger. All the bedrooms feature fully fitted wardrobes. There is an additional 2nd family bathroom with a further bath and shower. If additional accommodation is required, one of the sofas in the lounge can convert into a Queen-Size bed. There is also a crib if required for your convenience. The main Living Room (which is south facing) is situated at the back of the house with large windows looking out onto the pool and the golf course beyond. The Dining area also has views of the pool and the golf course and is south facing. There is a dining room table with 6 chairs, which is one of two eating areas available in the house. The Kitchen is fully fitted and very well equipped with a large range/oven, large microwave, dishwasher, fridge/freezer with ice maker, coffee machine, 4 slice toaster, blender etc. There is also a seating area in the kitchen, with views of the pool and the golf course beyond. There is a high chair for your convenience if required. The Family Room leads off from the kitchen at the back of the property, which also features large windows, and alarmed patio doors leading out onto the deck and heated swimming pool. The family room also features a 32-channel cable, remote controlled, colour T.V., with Play Station 2/DVD player and a selection DVDs.There is a separate laundry room, which houses a large capacity automatic washing machine, and separator tumble dryer. Along with an iron and ironing board. A telephone is installed in the kitchen and available to guests without charge for local calls. Long distance calls can be made by using a credit card. Phone cards may be purchased locally and used in conjunction with the phone system in the villa for your convenience. The private, screened swimming pool is accessed from the Family Room and is larger than average, (30 ft.) fitted with a powerful electric heater for all year round use with peaceful views over the golf course. There is a selection of luxury sun-loungers, a patio table and chairs to provide you with the opportunity of just enjoying and relaxing by your own private pool or for al fresco dining whether its breakfast, lunch or dinner! 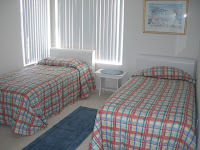 Our house will offer you the freedom and space to enjoy all Florida has to offer and then to relax in the peace and quiet of a spacious environment and enjoy your own private pool away from the crowds.